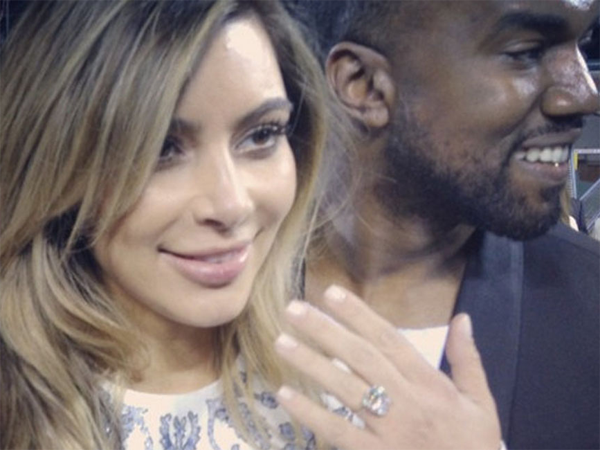 Kim Kardashian reportedly picked her engagement ring. The reality TV star’s boyfriend Kanye West popped the question to her on Monday 21 October on her 33rd birthday but it appears the brunette beauty knew the proposal was coming as she selected the lavish 15-carat diamond ring. A source told celebrity news website RadarOnline.com, “Kim picked out her engagement ring. The Keeping up with the Kardashians star’s engagement ring could be worth an eye-popping $7-8 million (R70-80 million) because the diamond has been flawlessly cut, according to expert jeweller Adelaide Polk-Bauman. In comparison, Kim’s previous engagement ring – given to her by her second ex-husband, basketball player Kris Humphries (28), in 2011 - is supposedly worth $2 million (R20 million), despite boasting a 16,2 carat diamond. Kanye proposed to Kim - the mother of his four-month-old daughter, North - by hiring out the AT&T Park baseball stadium in San Francisco, California in the US.